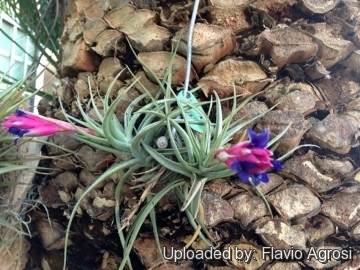 Origin and Habitat: Tillandsia aeranthos is native of Brazil, Paraguay, Argentina, and Paraguay. Altitude range: It is commonly found from near sea level to several hundred meters. Habitat and ecology: It grows as an epiphyte on trees in areas bordering rivers. It has a preference for mature tipa trees (Tipuana tipu) and tends to grow singly or in small clusters of two to a dozen plants. Tillandsia aeranthos, Tillandsia recurrata, likewise some epiphyllus and lichens, can injure phorophytes (plants on which an epiphyte grows) through several mechanisms short of parasitism. Phytotoxins may be released by tillandsias residents in tree crowns ensuring the rapid spread of the epiphytes in and around the forest. Defoliation of trees is the principal symptom. Such a phenomenon would favour these two heliophilic (adapted to attain maximum exposure to sunlight) bromeliads. Epiphytes may also damage supports by simply creating conditions conducive to pathogens that attack underlying phorophyte tissue. Some fungi associated with roots may turn epiphytes into reservoirs of infectious disease. Weight alone also injures phorophytes densely colonized by epiphytes, but there are other mechanical effects. Tillandsia aeranthos var. major Marn.-Lap. Leaves: Small, grey-green, about 7,5-9 (or more) cm long, spreading to erect, densely polystichous (leaves emanating in all directions from the stem), and covered with appressed (wings of trichomes laying flat, parallel to epidermis), cinereous (ash-colored) trichomes. Flowers: Blue with 3 petals whose tip is edged, containing six stamens flowers. The ovary is superior, tricarpellate and trilocular. The pistil is white and slightly visible. Floral bracts are bright red. Booming season: This is one of the mainstay species and while it is relatively common, it blooms like clockwork every Spring and it produces a vibrantly colourful inflorescence. A flower blooms for approximately a week. As each flower in a flower spike blooms with interval of a day, the spike becomes full bloom and showy in a week after starting. Hummingbirds love this plant! Similar species: It is very similar in appearance to Tillandsia bergeri but a look at the blooms of the two will show how different they are. Also, T. bergeri will often have several offsets growing from the base because it offsets all year round unlike T. aeranthos that is more typical of the genus and it generally offsets after the blooming cycle. 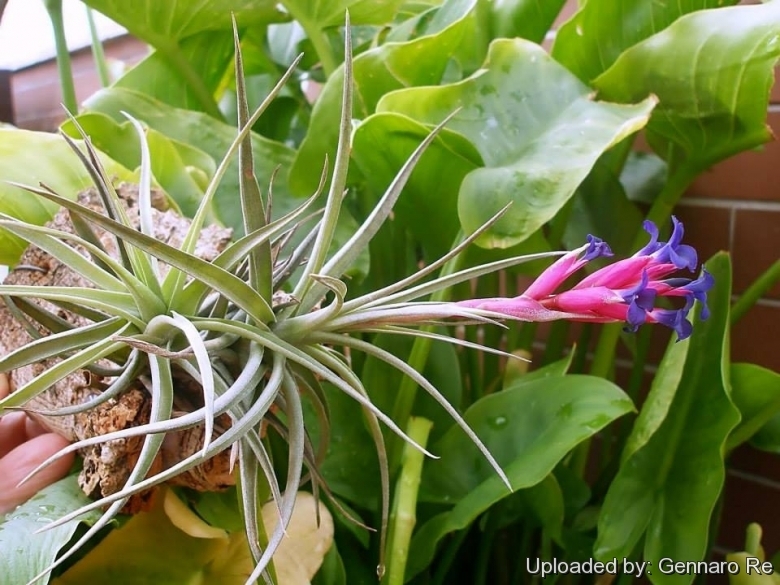 Cultivation and Propagation: The airplant (Tillandsia aeranthos) is a slow-growing variety and perhaps one of the easiest to grow, requiring only bright light and controlled watering to prevent constant wetness. It is a popular and easy to grow species that can tolerate temps near and even below freezing. It is drought tolerant, and will thrive within a broad latitude of care conditions. Anchor it as a hanging basket specimen or is simply hung it by a piece of wire and allows it to do its thing. Outdoors grow the air plant nestled in the highest reaches of a tree where it will receive very bright light and excellent air circulation. Growth rate: A strong grower, good bloomer, producing numbers of pups (what bromeliad growers call baby plants) in a short time. If one has patience, on a few seasons, T. aeranthos will form nice multi-plant clusters especially when grown as a hanging specimen. Soil: It is is exclusively epiphyte, which means it naturally grows on trees and needs no soil or transplanting. Exposition: It grows best in full sun to partial sun. In the hottest climates, it is best given some afternoon shade. In a dark location the plant will gradually weaken and wither. In winter, find a luminous place. 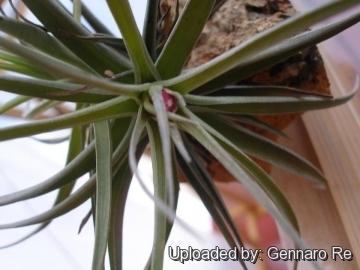 Watering: It should not be watered as frequently as other airplants. Just like for carnivorous plants, water them with rainwater or demineralized water. You can mist the leaves once a week, and make sure the plant gets dry quickly, whilst in winter with low temperatures it is better to leave it quite dry for avoiding possible rottenness. Fertilizer: The plant can grow without no fertilizer, because they make use of small traces of nutrients in the air, but you can apply a mild solutions (one-quartet strength) of foliar fertilizer at 3-month intervals to both garden and container plants. Hardiness: They are sensitive to heavy frost, but can easily tolerate sporadic light frost. However they grow best in a spot with plenty of light, with summertime temperatures of 20-30 C degrees or higher and winter temperatures around 15 ° C. USDA Zones 8 – 11. Put them inside or outside in summer when the weather is fine. Can live in a wide range of temperature, from 15°C to 45°C. Traditional uses: In Rio Grande do Sul Tillandsia aeranthos is used as a diuretic; decoctions are prescribed for blennorrhagia. Propagation: Division or seed. It is propagated by division of plantlets hung on bark slabs. Seeds are germinated on peat moss. Seeds need light to germinate.